We all know or have seen a superconductor on television. Something stuck in a very cold liquid on which there is something else floating in the air while the presenter tells us that “there is a superconductor”. 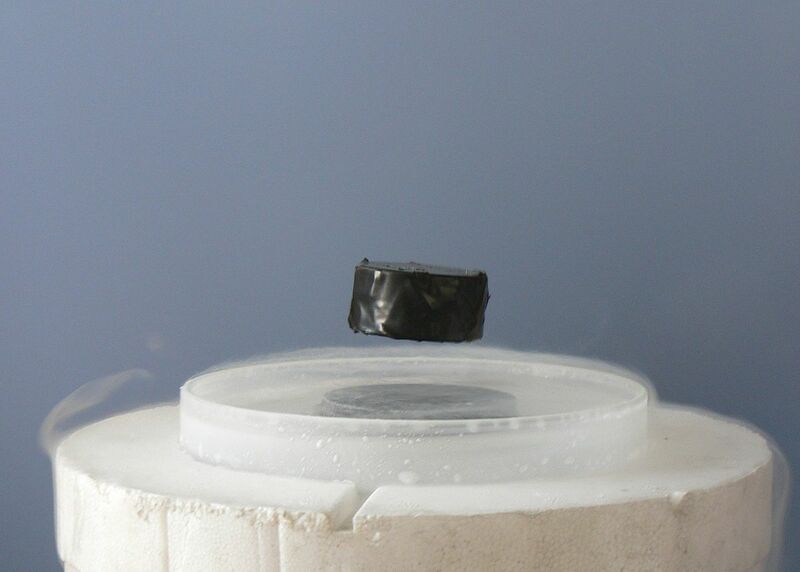 But in the end nobody has explained to us that it is that of a superconductor and because it makes levitate things. 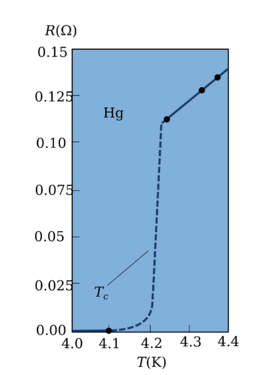 If I remember correctly, in 1911 H. Kamerlingh decided to study what happens if we pass a current on a metal at low temperatures. Until then, it was known that the resistance of a material was linearly dependent on temperature. Where is the resistivity of the material (a constant that depends on the type of material), L the length of the cable and A the area of the same. Nothing serious. In fact, in the tests with a light bulb the problem got colder, the bulb shone because the resistivity was lower. Because it is linear. But, friends, when I reach a very cold temperature (close to 0K) the resistivity was 0. That temperature is called critical temperature. Later, in 1957, three physicists (Jhon Bardeen, Leon Cooper and Robert Schrieffer) explained why this situation in what they called the BCS theory. Easily explained. The electric current is due to the fact that the electrons that are loose by the type of crystal that composes the material move towards the area of ​​lower potential (we are going to be a positive potential). Up to here it is quite easy to understand. That is to say, the material is composed of positive ions where the electrons “loose” of the electron gas of the crystal are coupled to the conductivity layers of said ions or jump from the valence layer to the conductivity layer because in the positive pole there is a great deficiency of electrons due to either a battery or a specific material. The positive ions in the crystal lattice, as its name indicates and as it always happens, are vibrating. It is not complicated to understand since in the glass they do not have in themselves a totally fixed position. At normal temperatures, the moving electron is creating a disturbance in that network and the positive ions that want that electron are attracted to it. That is, the electron disturbs the network and, in turn, this disturbance makes the electron more difficult for it to move because it is easier to hit with a positive ion. The result of all this is heat. If we lower the temperature, the ions will vibrate much less and therefore, the electrons will not “collide” so much and the disturbance will be much less or they will have less desire to be coupled to an ion and even this to release an electron when needing much more energy. But the loose electrons, as we have said, disturb the crystalline network creating a positive zone that not only attracts the electron that disturbs it, but also brings other electrons that walk around. That is to say, that the perturbation that the electron generates in the ions generates in turn attraction of other electrons even at low temperatures. But, since we are at a very low temperature, it does not have enough energy and the electrons “unite” since the repulsion between the electrons themselves (which are loose, not like the ions) by Coulomb is not enough to keep them separated. In short, the electrons “come together” (at a great distance, yes, but they come together). Quantically we know, by Pauli’s exclusion principle that two electrons, being fermions, can not form “nothing united” if they have quantum numbers. So, if, by chance, you find two electrons with different spin (remember the issue of spin measurement and how it varies) you create a pair of electrons with opposite spin between them (and therefore spin 0 in total). This is called Cooper pair. Remember that since we are at very low temperatures, there is not enough temperature to break the pair of Cooper and that we have, in our crystal, pairs of electrons that move together. This pair has spin 0 and the elements that have spin 0 are bosons (or behave like them). Why do I say this? because there can be more than one boson in the same quantum state and nothing happens. Let’s skip Pauli’s principle of exclusion, therefore there can be all those that we want and, above all, in the same energy state without problem. In the end, the Cooper pairs move in unison, together and, most importantly, without energy dissipation due to collisions between electrons and the positive ions of the network. That is to say that below 10K is when Cooper pairs can be created. And why do things float? As we have said, Cooper pairs move although there is no potential freely without hitting anything at low temperatures. If they do not leave the material, so that we understand each other, the only thing they can do is go around. A charge when it rotates creates a magnetic field (basic physics) and if it creates a magnetic field it can repel another magnetic field. This is called the Meissner effect. Result, if a metal is cooled to the temperature needed to create Cooper pairs, it creates a magnetic field that can repel another magnetic field and will therefore cause the “magnet” to levitate. There is no more mystery in the matter.